Is performance anxiety getting the best of you? Whether you are an actor, a musician, a comedian or simply need to give a talk or a presentation at work, sometimes you may feel so nervous about performing or speaking in front of an audience that even the thought produces fear in you and you'd do anything to avoid it. Even the most seasoned performers can experience this, and it is due to the emergency part of our brains (the "amygdala") interpreting your circumstance as a threat and switching on the fight or flight response. Some people seem to be natural public speakers: they appear charming, cool and confident; they stay relaxed and calm throughout the entire experience. For a lot of people, it is exactly the opposite: they fear public speaking more than most other endeavors and they find speaking in public a nerve wrecking experience. So what makes someone feel one way and not the other? Are you born good at speaking in public or can you overcome your fear and become a confident public speaker? The answer to this question has to do with our brain and its neuro-plasticity: that is, its capacity to change. In order to understand how this works, it is useful to know a thing or two about how emotions get processed in our brains and influence the way we behave. The Amygdala is a very primal part of our brain that is geared for survival. By allowing us to recognize danger and immediately react to it, it makes us more likely to be able to avoid it and thus survive. There are two parts of the Amygdala: the right side is responsible for registering risk in an immediate, profound and nonverbal way as if it were to say “oh-oh”… pay attention now! Anything bad that has happened in the past gets registered here and since the amygdala is very alert to changes in the environment when something is seen as dangerous (whether new or related to the past ‘bad’ event previously registered) it gets activated. When this happens we become scared and as a result, our sympathetic nervous system gets aroused in what we call the fight/freeze or fight response. We experience this as getting a fast heartbeat, sweating, and a general feeling of being ‘on edge’. After the ‘panic’ physical response has been triggered the information about the event is sent to the Hyppocampus (the part of the brain that deals with the exact details of the experience) and then it all gets sent to the pre-frontal cortex so that we can analyze what happened. People with panic and high anxiety levels have a bigger Amygdala than most. Whether this is because they were born with it or whether it developed as a result of trauma is not known but what is important to know is that is why these people might feel easily triggered by changes in the environment perceived as threatening. The good news is that there is another part of the Amygdala whose role is to help us ‘un-learn’: the left side. This side is responsible for comparing information as if it were to ask “Is what’s happening now exactly the same as what happened before?’ If the answer is no, it tells the right side to knock the fight or flight response off so that we can get back to normal. The thing is, sometimes the fear that has been triggered is so high that it over-rides everything and the left side cannot get the message across to the other side. So in order for the right side to register that we are indeed safe, we first need to be able to calm our automatic reaction of ‘panic’. How do we do that? Simple: we breathe deeply. Why does deep breathing work? This works because our autonomic nervous system has two branches: one that causes arousal (sympathetic) and the other that calms us down (parasympathetic). The two cannot be activated simultaneously, so if one is activated the other cannot be. In other words: if we have started the process of calming ourselves down we cannot possibly stay aroused. Conscious deep breathing immediately activates our parasympathetic nervous system. When this happens we gradually become calm enough to allow the left side of the amygdala to ‘think us out of the danger zone’. Above all express perfect confidence in your capacity to change. If you don’t believe it, who will? You can change and if you truly want to, you will! If you’d like help with the above techniques please feel free to contact me or just give me a ring on 075 44 24 7800. 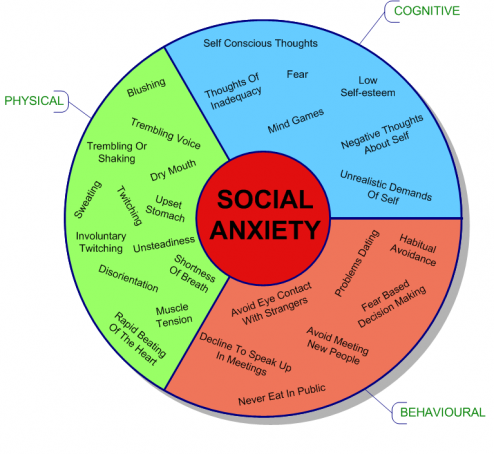 Social anxiety- what to do?